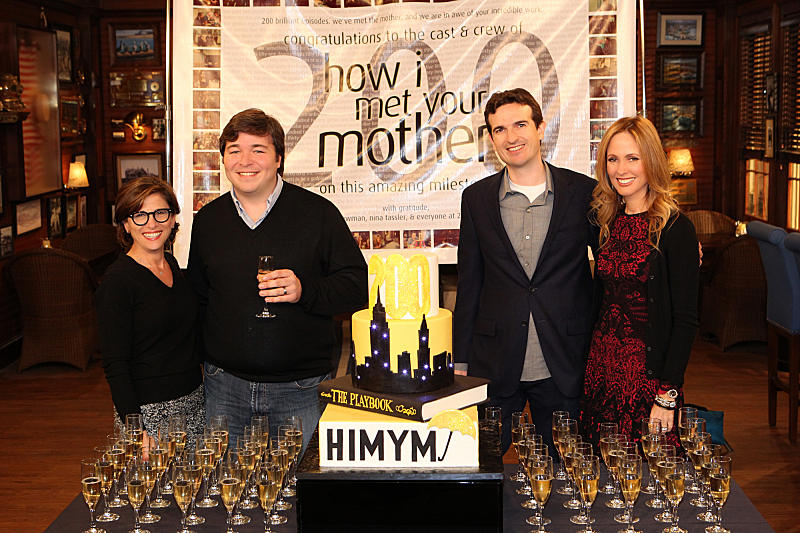 HOW I MET YOUR MOTHER celebrated reaching 200 episodes with an on-set celebration this past Thursday. Take a look at some photos from the event! (l-r); CBS President of Entertainment, Nina Tassler; Co-Creator/Executive Producer, Carter Bays; Co-Creator/Executive Producer, Craig Thomas; and Chairman & CEO, 20th Century Fox Television, Dana Walden celebrate the HOW I MET YOUR MOTHER 200th episode cake cutting in Los Angeles on Thursday, November 21, 2013 Photo: Sonja Flemming/CBS ÃÂ©2013 CBS Broadcasting, Inc. All Rights Reserved. HOW I MET YOUR MOTHER airs Mondays at 8 PM on CBS.